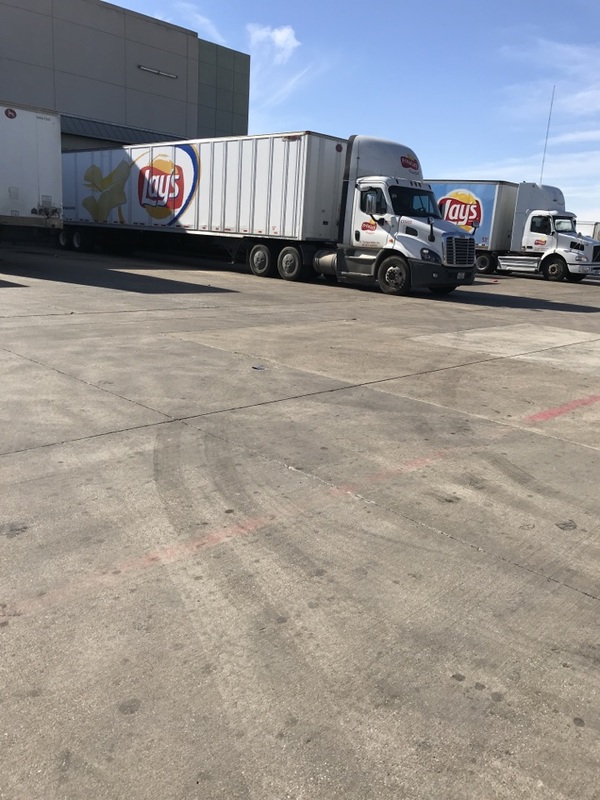 We show up on time, and we will actually call you if we hit a snag and run a few minutes late. Our professionals offer a Tune Up & Safety Inspection Special for $49.95 and we also have a 10% Discount when your request is from this Website's Contact Form. We will always get back with you in a timely manner and set an appointment for the earliest available time. We are serious about our commitment to our customers and the safety of our professional technicians. Our technicians are completely covered by Liability and Workers Compensation to protect you and your home or business from an unfortunate accident that might occur. This separates us from many of the contractors in this field of work. We believe you should know what a repair or installation will cost before anyone begins work. Based on our experience, we will provide you a Written Estimate that covers the costs involved with the work. We don't come back later to tell you that it costs more than originally quoted because we take the time to assess the situation before we ask you to sign anything. I had a problem with a motorized gate that wasn't working so I called Titan Doors & Gates early in the morning. John Stadler look at the problem and took care of it in a very professional way, timely and reasonable. The job was finish to my complete satisfaction. If I have a problem again they are the ones I will call. I recommend Titan Doors & Gates to anybody. Good professionals !! 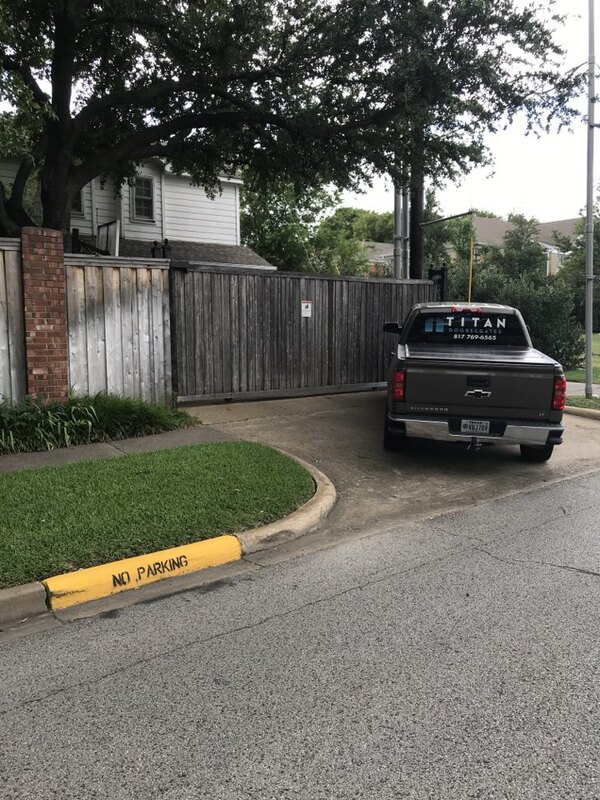 TITAN was able to help readjust this electric gate in Dallas so it doesn’t drag on the driveway. Sometimes that isn’t possible to change but in this instance we were able to make a difference. Beautiful trees can be a problem when they get large and lean into a slide gate’s path. 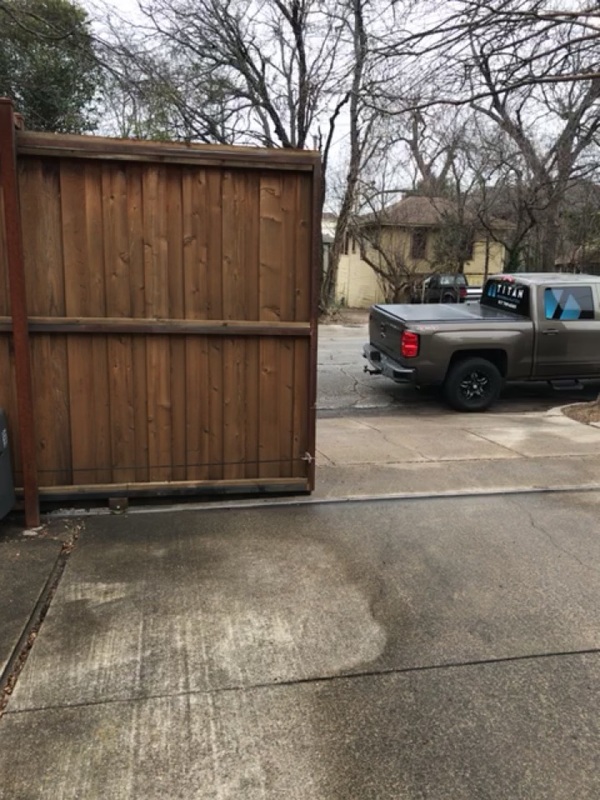 Today we had to reset the drive chain on a slide gate in Dallas that recently started hitting a tree leaning into it near the end of it’s run. It caused the chain to partially come off the gears, go into A screaming alarm and try to return to full closed position...not a good combination in this case. Because of the proximity, best to remove the tree before it causes additional damage. 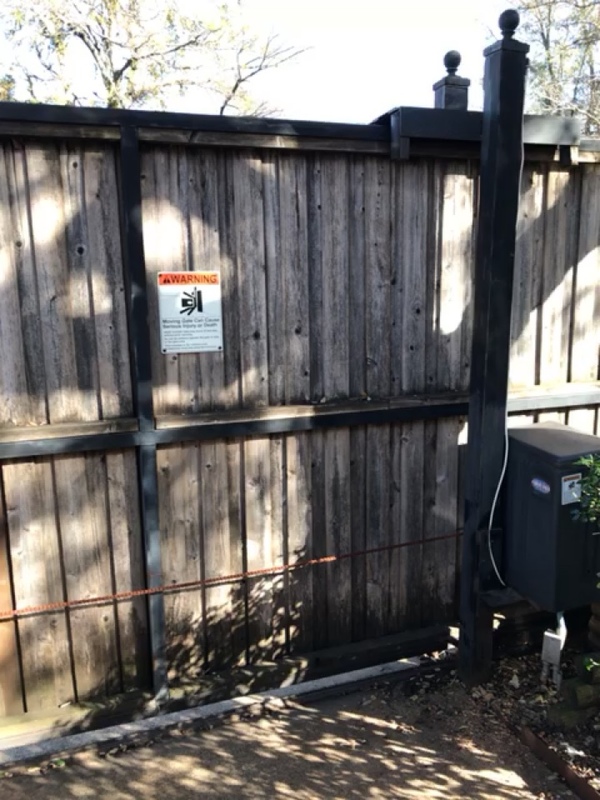 Repair /adjustments needed on a huge 8’ tall slide gate with a Liftmaster Operator in Dallas TX. Debris on the track caused overload and system crash. All working in good order again. Repairs made to a large slide gate with Cedar Board on Board. New Power Wheels and miscellaneous welding and additional chain required to get the gate setup properly. Discovered faulty limit switch mechanism on an Elite Slide Gate operator allowing large slide gate to run off the track. Replaced and reset/adjusted the limits to properly control gate travel. At one of the commercial facilities for a large national clients in Dallas TX. 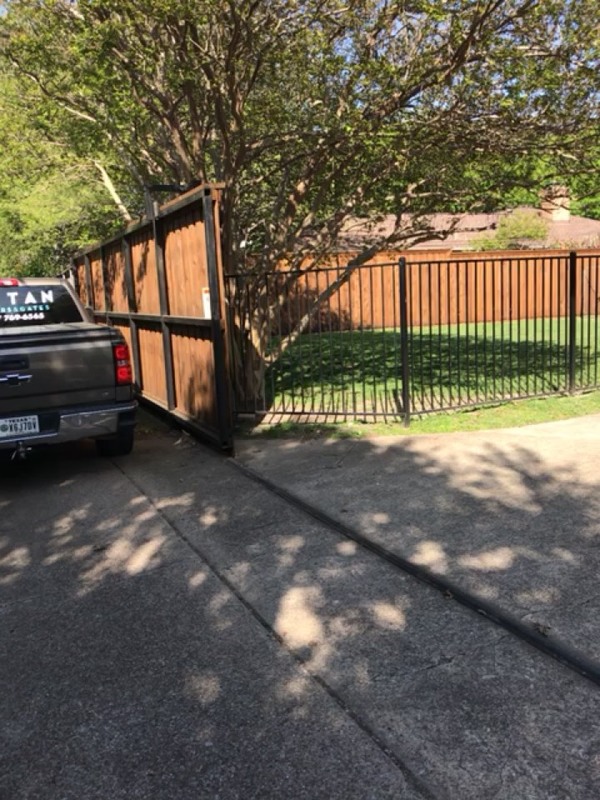 Repaired an electric slide gate in Dallas this afternoon. Just needed a little maintenance and chain adjustment. Checked the Control Board; although power was going into the board, it was intermittent at different locations indicating likely water damage. Dried the control board, connectors and reconnected. Power was restored but still show inconsistent readings at time. Decision was made to leave working Control Board and hopefully it will continue operating the gate. Found the gate not working due to low power. Checked/Replaced battery, reconnected system and got it working again. Verified all remotes still worked correctly. Repair Call in Dallas. The gate hinge post has settled and is no longer plumb (straight up & down. Will repair this situation with adjustable hinges next week. 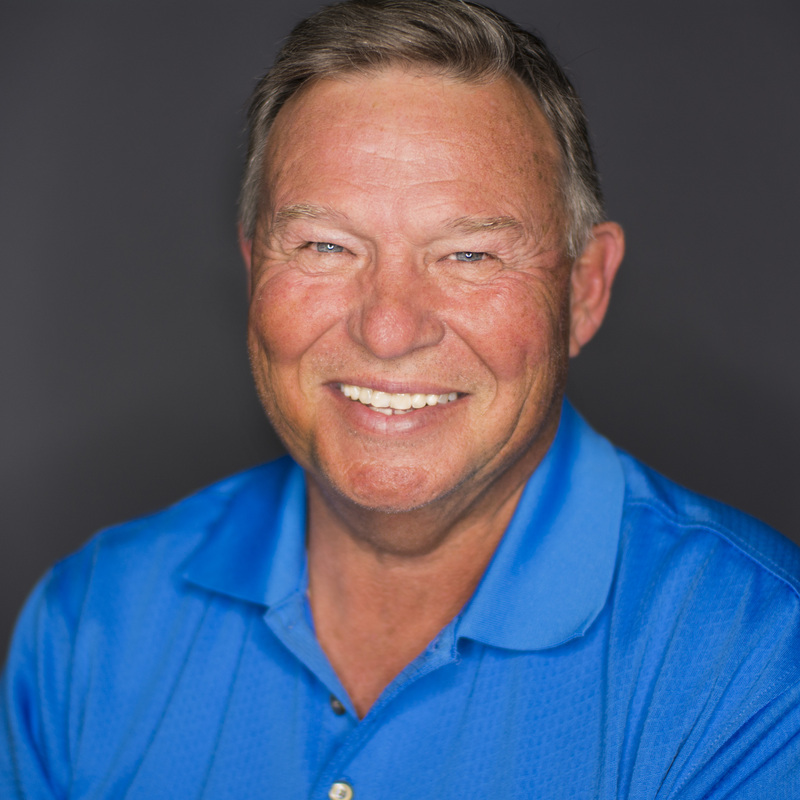 Is your electric gate malfunctioning? Does it keep getting stuck in place? Don’t get locked in or out of your property when our trained professionals are on hand and ready to help. 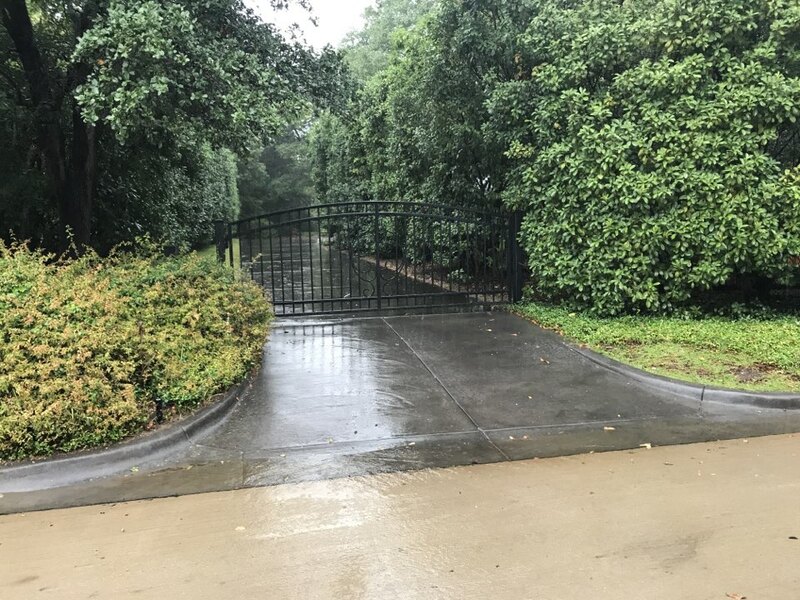 As an overhead doors and gates contractor in the Dallas / Fort Worth service area, we offer affordable, reliable electric gate, security gate or garage door installation services. 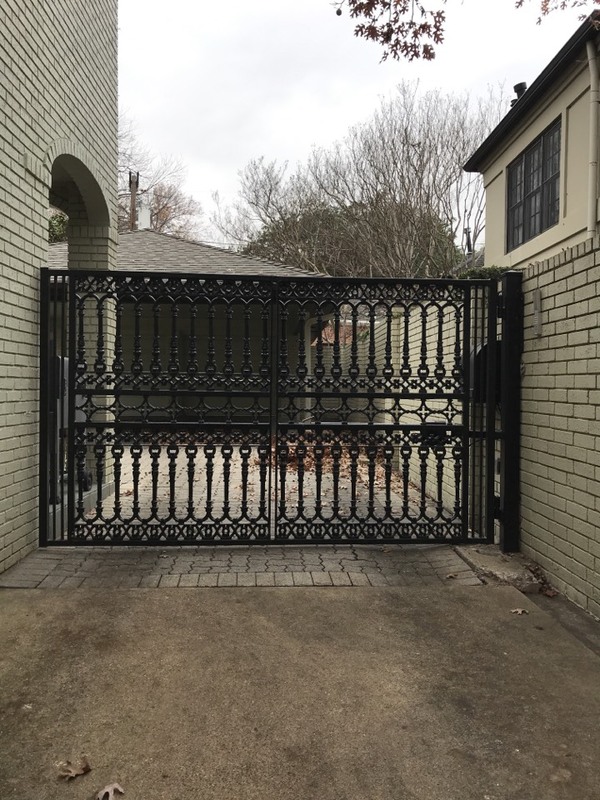 Our trained and experienced electric security gates and garage doors team strive to provide quick, efficient electric gate install and repair services for residential and commercial clients in need. We understand that when your gate stops working, it can seriously disrupt your daily life, business or routine. In some cases, it may mean that you’re stuck at home or the office until a security gates residential team can get there for a repair. We pledge to respond to your call promptly and provide effective electric security gates solutions. Because we value our customers, we keep our prices reasonable even if you’re in a bind. 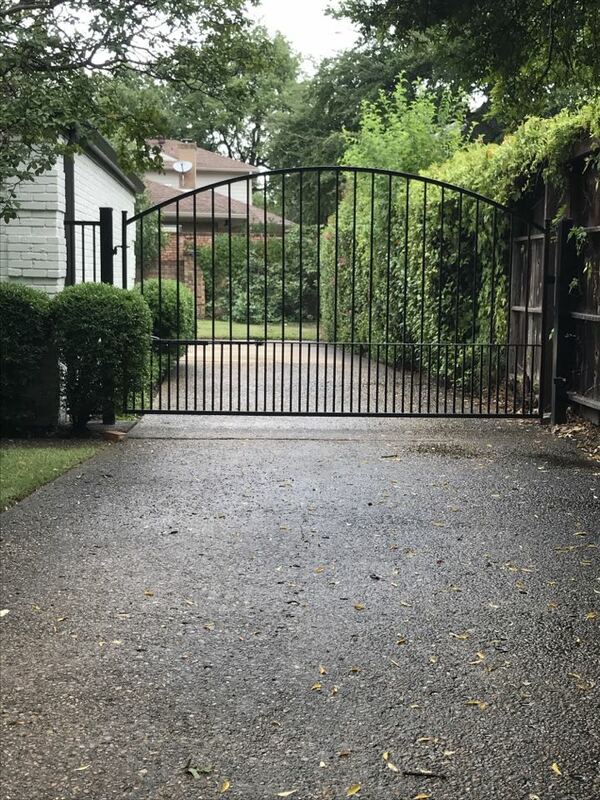 If you need dependable automated gate system or repair in the DFW Metroplex, trust our team of professionals to get the job done right. For more information or to schedule a service call, contact us today. We provide security driveway gates or electric security gates and installation, as well as Overhead Door Services too. We promise to promptly respond and can help with most any request you might have. We believe that you should expect to know what an electric gates repair or installation will cost before anyone begins work. Based on our experience, we will provide you a Free Written Estimate that will cover all the costs involved with the work. We will not need to come back later to tell you that it is going to cost more than originally quoted because we will take the time to fully assess the situation and site conditions before we hurriedly get you to sign a piece of paper that to many contractors is meaningless. Our electric gate repair team is available for Emergency Service, and we show up on time or call to communicate if we hit a snag that puts us behind schedule. Our professionals offer a Tune Up & Safety Inspection Special to keep your gate working great. We will always get back with you in a timely manner and set an appointment for the earliest available time.